The undergraduate and graduate programs at the LSU Robert Reich School of Landscape Architecture (RRSLA) have once again received top rankings from DesignIntelligence magazine, the leading journal of design professionals. The 2018–19 issue of “America’s Best Architecture & Design Schools” ranked the undergraduate program as number one in the nation and the graduate program as number five in the nation. 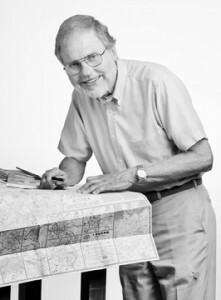 Max Conrad, professor of landscape architecture at LSU for over 50 years, was named a “Most Admired Educator” of 2018-19. Each year, DesignIntelligence honors excellence in architecture and design education, by naming outstanding professionals from these fields. Educators and administrators from the disciplines of architecture, interior design and landscape architecture are considered for inclusion. The Most Admired Educators are selected by DesignIntelligence staff with input from thousands of design professionals, academic department heads, and students. “It is hereby recognized that Max Conrad is honored and awarded the DesignIntelligence Most Admired Educator 2018-19 designation for his impact on students and the design practices, design professions, and the community. DesignIntelligence Most Admired Educators are chosen with extensive input by students, academic department heads, design professionals, and more,” stated David Gilmore, President & CEO of DesignIntelligence. “This was a big surprise to me and I want to thank all who made this honor possible,” Conrad said. Alumni from many years at LSU sent their congratulations to Professor Conrad, sharing their positive memories of his classes and many student trips that he organized. All agreed that he is a most admired educator. LSU’s landscape architecture undergraduate program has been consistently ranked in the top two in the nation for well over a decade; the 2018–19 ranking is the ninth time the undergraduate program has held the number one position since 2006. The graduate program has also been ranked within the top six in the nation for over 10 years, sharing top rankings with Harvard, Cornell, the University of California, Berkeley, and the University of Pennsylvania. LSU is by far the most affordable graduate program of the top five.